From the 1870s onwards more people began to take part in and to watch sport. Before this time organised sports such as rugby and football had only been played in private schools and universities, sport outside these institutions was unsystematic and disorganised. In the 1870s rules were drawn up and for the first time employers started to encourage their workforces to participate believing that team games helped to encourage unity and collaboration. 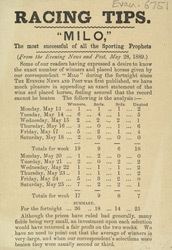 Journals such as ‘Milo’ were printed and distributed nationally encouraging an increase in interest in sporting activities and events.